Laser eye surgery is a procedure whereby the eye is corrected so that the person no longer needs glasses or contact lenses. It has recently become a very common cosmetic procedure. 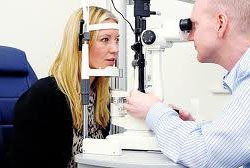 This means that there is an increased risk of finding unqualified or badly qualified practitioners and everybody is strongly advised to really research the clinic they will be using, as well as having a consultation with the professional that will be treating your eyes, asking to see their qualifications. Laser eye surgery is available on the NHS (meaning the NHS will pay for the costs), but only if the underlying condition can lead to loss of sight if left untreated. Diabetic retinopathy, usually caused by diabetes, is one of the conditions that the NHS will consider. The NHS will not usually consider funding laser treatment solely to improve vision, as this can be corrected by wearing glasses or contact lenses. Although there are some NHS Trusts across the UK that do offer laser eye surgeries, a fee will be payable should you choose to go for the procedure. You have a prescription that is considered to be safe for surgery and this prescription has remained the same for the past 12 months. Of course, if the surgery is performed on the NHS, you can rest assured that the surgeon is a fully qualified ophthalmologist, which should give you great peace of mind. Depending on the type of surgery you will require on the NHS, the procedure will also vary. For sight improvement, the cosmetic procedure, a flap is cut in the cornea, which is then reshaped. For diabetic retinopathy, the laser will target blood vessels on the outside of the retina, which will stop them from leaking fluids that will damage the retina and sight. NHS laser eye surgery can be performed at specialised NHS Foundation Trust eye hospitals that can be found across the country. Your GP or local PCT should be able to advise you on which eye hospital is closest to your location. So in conclusion, NHS laser eye surgery is usually only available if you have an eye condition that could lead to blindness. If it is not, the surgery would be classed as non-essential and hence cosmetic and you will have to pay for the costs yourself. However, opting to have the laser eye surgery done through the NHS (even if you pay for the costs) should give you the peace of mind to know that your surgery will be performed in a specialised unit and by someone who is fully qualified. You must make sure you meet the different criteria set by the NHS, as described above, of course.